Cobras are highly venomous snakes famous for the threatening hood at their neck. There are 28 species of cobras, who are regarded as “true cobras” (genus Naja). The king cobra despite the word “cobra” in its common name, is not a member of the Naja genus (the “true cobras”). Cobras are long lived snakes. The lifespan is from 20 to 30 years, depending on the species. The largest true cobra species is the forest cobra (Naja melanoleuca), reaching up to 3.1 meters (10 feet) in length. The smallest true cobra species is the Mozambique spitting cobra (Naja mossambica) which is about 1.2 meters (4 feet) long. All cobras have specialized muscles and ribs in the neck that can flare out when the cobra feels threatened. Cobras are able to raise their body up, spread the hood, and hiss loudly to scare off most threats. In addition to their trademark hoods, cobras have round pupils and smooth scales. Cobras come in varying colors including black, dark brown, red, yellow and yellowish white. Cobras can be nocturnal or diurnal, depending on the species. Cobras use their forked tongue to smell prey. The tongue moves in and out, picking up odor particles from the ground and passing them over a special smelling organ in the roof of the mouth, called the Jacobson’s organ. This helps the snake sniff out its next meal. The cobra captures its prey by feeling vibrations on the ground and scoping out what’s causing the vibrations. The cobra, like other venomous snakes, is lightning fast when it strikes. Cobra’s venom is a neurotoxin that stops the victim’s breathing and heartbeat. Cobras are carnivorous snakes and feed on other snakes, lizards, small mammals, birds and bird eggs. A cobra can eat almost any type of snake, including other venomous snakes. Like all snakes, a cobra’s jaws have two independent bones that are loosely attached to its skull. This lets the snake swallow an animal that is wider than its own head. The throat of the cobra has specially designed spikes that help it to digest its food. The spikes work to pierce the prey as it moves through the throat. When a cobra swallows an egg, the spike breaks apart the shell, allowing the yolk and egg white to slide through the rest of the digestive system, and the shell is regurgitated. slow metabolism makes this possible. Cobras reproduce by laying eggs. Before female lays her eggs, she builds a nest with leaves, using her body and head to move things. Females typically lay 20 to 40 eggs at a time. Than she covers eggs with leaves, and places herself on top to incubate them until they hatch. Wild boars and mongooses are known to steal cobra eggs. The mongoose is the best-known enemy of the cobra. Mongooses have thick fur to protect against cobra fangs and often defeat cobras in fights using their speed and agility. They can bite the cobra’s back before the snake can defend itself. Cobras are also threatened from other snakes, a few large birds of prey like the secretary bird and humans. Currently, the only cobra species the IUCN lists as endangered is the Fiji snake (Ogmodon vitianus) but the numbers of the other 27 species have been reduced by the loss of habitat in some parts of their range. Cobras are very intelligent, and can learn quickly, which helps them avoid dangerous areas. Spitting cobra refers to any one of several cobra species that have the ability to spit or spray venom from their fangs in defense. They have the ability to shoot venom from their fangs directly into the eyes of the victim with terrifying accuracy. They are the only snake in the world that can spit their venom. Some cobra species “play possum” and may pretend they are dead by convulsing and then lying completely still until the threat has passed. The sight of a large cobra reared up in a bold warning stance is known to stop elephants in their tracks. A group of cobra is called a quiver. The origin of this genus name is from the Sanskrit nāga (with a hard “g”) meaning “snake”. 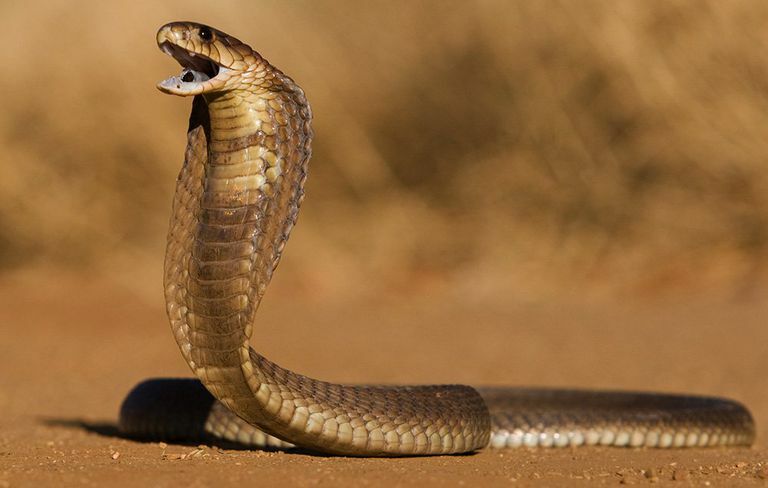 All true cobra species are capable of delivering a fatal bite to a human. But they only attacks a human if it feels threatened. Snake charming is the practice of pretending to hypnotize a snake by playing an instrument called pungi or bansuri. The most popular species are those native to the snake charmer’s home region, typically various kinds of cobras. Many snake charmers remove the fangs or the venom sacs from their snakes, because it is too dangerous. This practice is illegal, and is considered inhumane to the snake. It is also illegal to keep a cobra as a pet.